Revamp your dining space with an industrial bar-height table aesthetic with modern appeal. Designed with long tapering metal legs, this tall table provides effortless sophistication. Complete with crisp and clean lines to accentuate the minimalistic appearance, this bar-height table is the perfect finishing touch for your dining space. 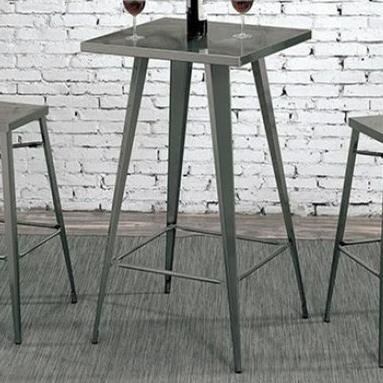 The Timon Industrial Bar Height Metal Table by Furniture of America at Furniture Superstore - NM in the Albuquerque, Los Ranchos De Albuquerque, Rio Rancho, Santa Fe, Corrales, NM area. Product availability may vary. Contact us for the most current availability on this product. Browse other items in the Timon collection from Furniture Superstore - NM in the Albuquerque, Los Ranchos De Albuquerque, Rio Rancho, Santa Fe, Corrales, NM area.